When you go vegan, you don’t have to miss out on any of your favorite flavors, barbecue included! While family picnics and barbecue may invoke visions of steak and chicken on the grill, the plant world offers just as much flavor and way more variety when it comes to what to spread this favorite American sauce on. Portobello mushrooms, cauliflower, carrots, even brussels sprouts can be coated with barbecue sauce and come out with a hearty and delicious flavor. Now you can go to summer picnics with a dish to wow your friends and family and show them just how delicious vegan bbq food can be! All good barbecue recipes start with a sauce. If you’d prefer to make your own sauce, the following barbecue sauces are simple and easy to modify depending on your taste preferences. Try adding in liquid smoke or pineapple juice for alternate flavors or experiment with blending in different hot peppers such as jalapeno, habanero or tabasco. In a small saucepan on medium heat, combine the garlic tomato paste, chili powder, paprika, and cloves. Cook, stirring constantly, for 3 minutes. Add the remaining ingredients, except the salt and pepper, and turn up the heat to medium-high until they come to a boil. Reduce the heat to low, and simmer, covered, for 30 minutes, stirring occasionally. You can taste as you go along and adjust if you like, but I recommend NOT adding more molasses or dates until you’ve pureed in step 4. The dates sweeten the sauce as they cook, and they’ll add even more sweetness when you puree. When your 30 minutes are up, remove the pan from the heat, then use your immersion blender to puree into a nice, smooth sauce. If you don’t have an immersion blender, let the sauce cool a bit, then transfer to a regular blender. At this point, your sauce may be ready to bottle and refrigerate (It will keep for up to a week.). Taste it, and see if it needs any adjusting. This is where you’ll stir in sauce and pepper, to taste. If it does need anything else, turn the heat on medium-low, and let any additions cook for a few minutes before you taste again. A Video on Ho to Make Vegan Barbecue Sauce in a Blender! Throw everything into your blender, and blast on high for 30 to 60 seconds, until smooth. Tweak the salt, pepper, and chili powder to taste. Transfer to a bottle, and store in the fridge for up to 7 days. 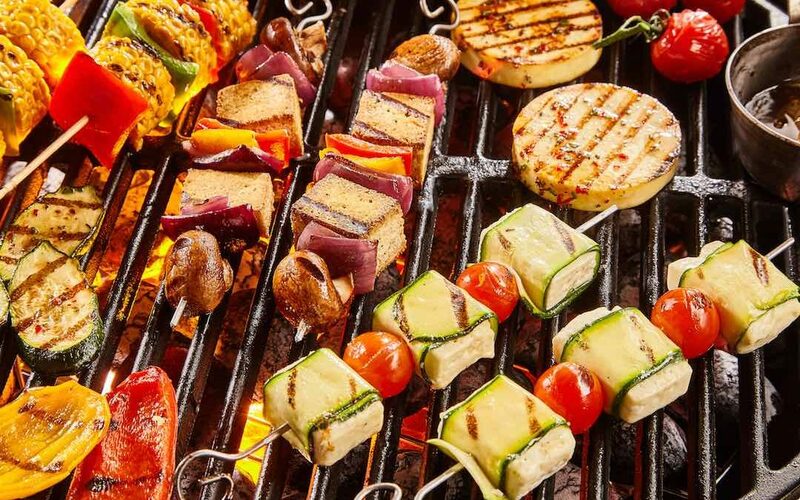 Here are eight more delicious vegan barbecue recipes sure to delight your taste buds and make your summer taste divine! Vegan hotdogs are relatively easy to find at most grocery stores, but making your own, from carrots? This whole food based recipe is inventive and delicious, using the firm texture of boiled carrots along with spices to replace hot dogs. This recipe is healthy, easy to make and relatively cheap, meaning you can eat vegan hot dogs every night of the week. Add on the creamy chickpea salad and you’ve got yourself the most perfect barbecue food ever, sharing optional. This simple burger recipe relies on chickpeas and sweet potatoes to make delectable and filling vegan burgers with a barbecue flavor. This recipe has a 40 minute prep time and a 40 minute cook time, so it may be worthwhile to make a double batch and freeze some for easy weeknight dinners. Serve these up with onion, avocado and homemade raw slaw for the perfect summertime burger. Cauliflower is having a moment, and rightly so. When you can use cauliflower to stand in for chicken in a BBQ wings recipe, you know you’ve found yourself a vegetable worth stocking in the fridge. This recipe comes together quickly, can be made gluten-free and requires only a handful of ingredients. Make yourself these wings and dip them in a vegan cashew ranch for the ultimate healthy comfort food. Let’s be honest, is there anything that doesn’t belong in a taco? The answer is clearly no, and these BBQ Portobello tacos are genius. Using a sweet and spicy homemade barbecue sauce to marinade the mushrooms gives a ton of flavor with little effort. Throw in the spicy mustard slaw and you’ve got an intensely flavorful yet quick dinner that you can wrap up in soft shells and devour over, and over and over again. This smoky black bean burger is sure to become a staple recipe for any burger loving vegan. The Minimalist Baker has created this delicious whole foods burger from only 10, easy to find ingredients (think black beans, sweet potato, pecans, quinoa) and created a masterpiece. The only downside is this recipe is a labor of love, requiring a full hour and forty-five minutes from start to finish, so consider doubling the batch and freezing some for another day. “French fries, BBQ sauce, Texas brisket rubbed mushrooms, jalapenos, and vegan cheese.” This mouthwatering recipe is like the spicier, BBQ version of a loaded French fry plate. It comes together quickly and can be modified pretty easily to accommodate whatever you have on hand. Swap out the vegan cheese shreds for creamy nacho cheese or replace the pickled jalapenos with crushed red pepper flakes. However you make this recipe, you can’t go wrong, and you will want to eat the entire plate. This lentil loaf consists of only 8 simple ingredients and is whole foods based. The hearty lentils mixed with corn and flavors of garlic, chipotle and barbecue come together for a filling and delicious loaf perfect for any time you’re in the mood for barbecue. This loaf does require 2 hours of your time, so save it for special occasions or for the people in your life who love barbecue flavored anything. Brussels Sprouts for too long have gotten a bad rep, but that is thankfully changing! This recipe uses these delicious green buds to make a mouthwatering side that everyone will love. With only a handful of ingredients and about 35 minutes, you can create crispy barbecued brussels sprouts to bring to your next family gathering. Summertime means cookouts and picnics and there’s no reason to find yourself at one without anything to eat. With a little forethought and preparation, you can make delicious vegan barbecue creations that will eliminate alienation and showcase just how incredible the world of plant-based cooking can be. As vegans, we are the ambassadors of the plant cuisine world and get to be the example for our family and friends. If we are healthy and happy and have food that looks and tastes delicious, we invite people to see veganism as not just a fringe diet, but a lifestyle of health and abundance.